Well hello there! It's only been a couple of days since the A-Z blogging challenge ended, but after blogging nearly every day - taking a short break seemed like a really long time! I announced when I did the sneak peek of my upcoming challenge kit, that I would have kits available this week, however, I'm going to hold off for a little while because there are a lot of other challenges going on...so stay tuned for a June announcement of the kit and I think we'll just take the summer to work on the kits with an end of summer reveal date! Some time this month though, I've got another quicky challenge/call to artists up my sleeve....it's for a good cause, and I hope I get lots of takers!! Are you working on a lot of challenges? Karyn just announced the Project 5 projects for Beading Babes, featuring two of Helena Tang-Lin's patterns. Until yesterday, I never familiarized myself with Helena's patterns - but boy, I'm sure glad I did! 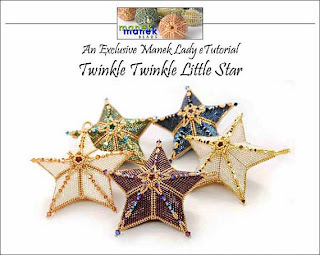 I just picked up the Twinkle Twinkle Little Star tutorial - and I am very very excited to have a holiday present in mind for so many people already! How GORGEOUS are these?!?!? Heck - if I get started on these this month- I'll be in great shape by December! :) Both of the Beading Babes projects look awesome and I'm so excited to do them both! 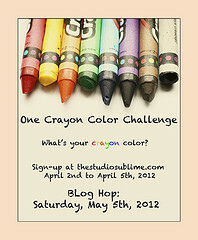 This Saturday I will be taking part in the One Crayon Color challenge, hosted by Sally Russick. My color is orange - I am looking forward to all the monochromatic reveals this weekend! Erin Prais-Hintz is hosting a Challenge of Literature blog hop. I love to read and a few books immediately came to mind when I signed up for this one! Michelle Mach is at it again with her non-beady creative challenge ideas, this time it is a Tiny Tin Challenge. My tins came last week and I've got lots of beady and non-beady ideas floating around for this one!!! I've seen lots of familiar names on the participants lists for these! Looks like we'll all be very busy this month! I'm excited about the Beading Babes projects too, Amy! I love Helena's designs and I wanted to do the Nefertiti piece as soon as I saw it. I had been to her website before and I had decided I wanted the Twinkle Twinkle Little Star pattern for Christmas also! I haven't ordered it yet but it's on my list. I'm excited about the Beading Babes Project 5 also and looking forward to doing both pieces. I went to Helena's site today and I have several of her patterns in mind for purchase. The Twinkle Twinkle Little Star looks like it would be a big challenge for me, but it is beautiful! I am also a participate in those other challenges you mentioned, well I hope to be participating in Erin's. I will be announcing a challenge on the 7th. I am happy to have introduced you to Helena's work...I adore some of her designs including the Twinkle Twinkle Little Star tutorial - such a beautiful design and don't they look just gorgeous all together. I have a lot of my plate the next few months... between Beading Babes and the Battle of the Beadsmith I reckon I am going to end up with blisters from so much beading... but it's all good! Those little stars are so beautiful! Those stars are amazing! I always think I'm going to start beading for Christmas in the summer, but it never happens. Maybe this year! Looking forwarding to seeing what you come up with for the Tiny Tin Challenge!